Reset the join buffer for reading/writing: default implementation. This constructor creates a join cache, linked or not. The cache is to be used to join table 'tab' to the result of joining the previous tables specified by the 'j' parameter. The parameter 'prev' specifies the previous cache object to which this cache is linked, or NULL if this cache is not linked. This method must determine the minimum size for the auxiliary buffer. If no auxiliary buffer is needed the function should return 0. Initialize operation's internal state. Called once per query execution. 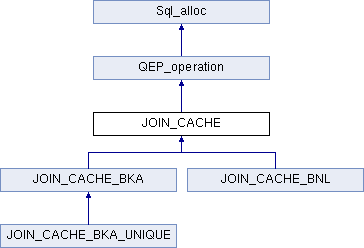 Implemented in JOIN_CACHE_BKA_UNIQUE, JOIN_CACHE_BKA, and JOIN_CACHE_BNL. return one of enum_nested_loop_state values.